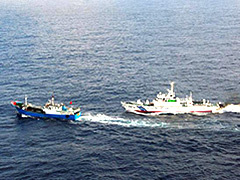 Illegal fishing continues to grow as an unfortunate environmental reality. An inordinately large percentage of fish sold on the open market derive from illegal fishing activities, and the problem is particularly prevalent in Belize, Cambodia, and Guinea—three countries whose seafood imports have all been banned from the European Union until regulations are more strictly enforced. Belize, which has endured hundreds of fishing infractions over the course of the last several years, faces an especially dire situation because fuel prices have eaten up a large portion of the nation’s budget set aside for patrol officers. With resources spread so thin, the country employs only 70 enforcement officers to cover a wide stretch of coastline and over 200 islands. Enter the Wildlife Conservation Society, who in June started up a unique project partnering the fisheries departments in Belize with a U.S. group called Conservation Drones. The idea is to operate a fleet of drones, also known as Unmanned Aerial Vehicles (UAVs), to help patrol the area around Belize for illegal fishing vessels. Currently the drones are restricted to the mainland, but as the project develops, the aircraft will gradually move to Glover Reef, an atoll of the southern coast of Belize and a protected area as determined by the 1993 Fisheries Act. Although drones rose to popularity in the unfortunate context of the war in the Middle East, UAVs now serve a number of more practical and mundane functions, such as studying wildlife and managing farms. Many private citizens have even begun manufacturing their own UAVs as novelties or for private use. The robot aircraft are not only cheap to build, but run no risk of human casualty since they are operated remotely. More and more government agencies are reportedly considering instituting drones to monitor illegal activities that occur in their coastal waters. In the near future, drones are even expected to be able to stream live video to help accomplish this. If Belize experiences success with its fledgling drone experiment, expect other nations to jump onboard and begin development of similar projects. Why Are Fossil Fuels Bad for the Environment? Posted on July 28th under Global Ecology.